Many people believe that credit cards are evil and are best left alone. And although this isn’t always the case, you must think carefully before taking one out. As with all forms of credit a borrower must be over the age of 18 in order to apply for one – this goes for store cards too. So what would you need a credit card for? Well, they are best used to borrow small amounts of money of short periods of time and are more suited to those people who are able to pay off the balance regularly and are good at sticking to a budget. Credit cards have become more and more popular over the last decade, and as such more and more providers have launched competitive products. This also means that the Annual Percentage Rate (APR) – the interest rate charged over 12 months – for credit cards differ from product to product. When you purchase something on a credit card, essentially you are paying for it with money that you haven’t necessarily got. If you then fail to pay off the outstanding debt to the provider at the end of the month you will be charged interest every day on the amount left to pay. 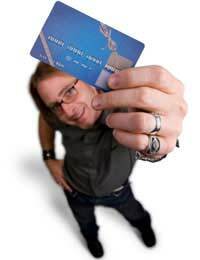 Usually card providers require you to pay off a minimum amount of 5 per cent each month. There is also a spending limit on your credit card, which you can apply to have increased if you find it to be too little. However, if you exceed this limit without permission you will incur a charge of around £20. If you wish to withdraw cash from an ATM, unlike debit cards, you will be charged a small fee and really should only do this in an emergency. Credit cards are, however, very useful when you are abroad because they allow you to withdraw in a foreign currency and many foreign countries accept credit cards as a form of payment. Providers do usually charge a small fee for this though too. There are three main groups of people who are involved in the credit card process – the consumer, the bank and the system. The system is what makes it possible for shops and other outlets to accept card payments. You might recognise some of the systems – American Express, Mastercard, or Visa. It is the system that processes the credit card number and what has been purchased, matching it up to the date, time and wherabouts of the card. This information is then passed on to the bank that issued the card. The consumer has to sign a receipt or enter their Personal Identification Number (PIN) to agree to the transaction and to confirm that they are the authorised user of the card. There is a magnetic strip on the back of every credit card, and it is this that holds information such as your credit limit. It is the bank that have actually lent you the money. Many people get confused by this and often believe that Mastercard or Visa are the ones that have lent them the money. I recently transferred online a credit card balance to a new credit card. Something made me feel the transfer hadn't gone through so I repeated it. Unfortunately, the first attempt had, in fact, gone through and I am now landed with a credit balance on the new card which does not represent any actual expenditure but is simply a mistake. Can you please tell me how I convince the bank that the credit balance on my credit card is wrong and that it does not all need repayment? I am worried about this and could kick myself for such stupidity. You would have to ring customer services and explain your mistake. It should be provable if the transferred amount is the same.